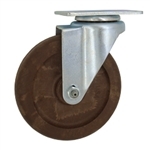 Service Caster Corporation stocks and distributes high temperature glass-filled nylon wheels. 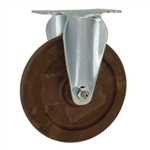 A glass-filled nylon caster wheel is ideal for locations where a moist heat is expected. Exposure to heat up to 475° F for 30 continuous minutes of operation is the recommended maximum temperature and time. Usage beyond those parameters will reduce the life expectancy of the wheel.